This is a beautiful plant with some unfortunate names, which arises from the odour emitted from the flowers, but only noticeable at close range. The flowers are, in fact, rather beautiful and, in this case, palest blue. 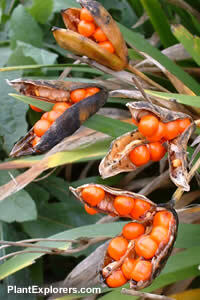 And the seed pods that follow are possibly this plant’s greatest asset, splitting open in the autumn to reveal bright orange seed, which remain for more than a month. Height 12 to 36 inches. For maximum freshness, please keep seed refrigerated in its original packaging until it is time to plant. Sow seed in containers in a coldframe in autumn or spring. Seed may also be sown <i><b>in situ</b></i>. Grow in well-drained, neutral to acidic soil in full sun.